Despite these medical advances and huge monies spent on healthcare, Man remains immersed in mental and physical illness and every person still die. Trillions of dollars are spent on healthcare. Despite spending unprecedented levels, mental illness is growing with increasing levels of depression and suicide. Despite extraordinary advances in medical technology, Man still suffers high levels of disease and the inevitable effects of human aging. Much of Man’s suffering is the result of the spiritual sickness of Sin. Sinful indulgence leads to physical suffering: gluttony and the obesity epidemic has led to growing levels of heart disease/diabetes; substance abuse has resulted in various health problems; sexual promiscuity increases sexual disease. The rejection of Christian morality has resulted in growing levels of mental anguish: sexual promiscuity and the rejection/attempted redefinition of marriage has led to abortion and great numbers of children suffering with broken/unformed families; adultery and selfishness has led to increased divorce and the collapse of the family. Man’s personal choice to sin causes much of today’s human anguish. Identifies sin as a sickness – “And when the Pharisees saw this, they said to his disciples, “Why does your teacher eat with tax collectors and sinners?” But when he heard it, he said, “Those who are well have no need of a physician, but those who are sick” (Matt 9:11-12). Is the healer of sin – Jesus’ name means “God saves” (CCC 430). He comes to save the whole person from sin and its effects (Mark 2:5-12), healing every disease and infirmity (Matt 9:35). Takes on Man’s illness – “Moved by so much suffering, Christ not only allows himself to be touched by the sick, but he makes their miseries his own…On the Cross, Christ took upon himself the whole weight of evil and took away the ‘sin of the world’, of which illness is only a consequence” (CCC 1505). Links healing and preaching – Jesus places great emphasis on both healing and preaching (Matt 9:35). The Gospels lists at least 34 different mentions of the healing actions of Jesus that often are linked to major sermons by Christ (e.g. Healing miracles after the Sermon of the Mount – Matt 8; Healing of the man born blind and “I AM” pronouncements – John 9-10). For Christ, hearing the gospel and healing are bound tightly together. Heals all types of people in all kinds of settings – Jesus heals Jews and Gentiles, men and women, adults and children. He heals mostly in public and sometimes in private (deaf mute – Mark 7:31-37). He heals in Jerusalem, Samaria, Galilee and beyond (Mark 7:24-30). He heals in homes (the paralyzed man – Mark 2:1-12), in synagogues (Mark 1:21-28). He heals those who are grateful (the Samaritan leper – Luke 17:11-19) and those who are not (the ill man at the Pool of Bethzatha – John 5:1-17). Heals every kind of physical ailment – Jesus heals every kind of physical ailment (Matt 4:23-25) including: infections (Peter’s mother – Mark 1:29-31), bones (man with withered hand – Mark 3:1-6; deformed woman – Luke 13:10-17), muscular (paralytic man – Mark 2:1-12), internal organs (woman with a hemorrhage – Mark 5:24-34), skin (leprosy – Matt 8:1-4), nervous system (epileptics – Matt 4:23-25), circulatory (man with dropsy – Luke 14:1-16), eyesight (man born blind – John 9:1-41), hearing (deaf man – Mark 7:31-37), speech (mute man – Luke 11:14-15) and those who have been mutilated or maimed (Malchus’ ear – Luke 22:47-53; Matt 15:29-31). Heals mental/spiritual aliments – Demonic possession affects a person’s mental health. Jesus heals those possessed by demons returning people to spiritual and mental health (Matt 9:33; Matt 17:18; Mark 16:9; Luke 8:30). Heals the near-dead and dead – Jesus heals the near dead (Centurion’s slave – Matt 8:5-13) and even those who are dead (Jarius’ daughter – Mark 5:22-43; the widow’s son – Luke 7:11-17; Lazarus – John 11:1-45). Heals using various methods – Jesus heals using a variety of methods including through His spoken word (Matt 8:16), through power that emanates from His body/clothes (woman with a hemorrhage – Luke 8:49-56; crowd who touch His garment – Mark 6:53-56), through the use of physical things (saliva – Mark 7:33; mud – John 9:6) and even heals those who are not in His presence (Jairus’ daughter – Matt 9:18-26; the Syrophonecian woman’s daughter – Mark 7:24-30). 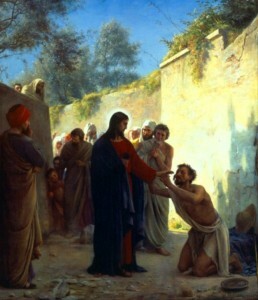 Heals for a variety of reasons – Jesus heals for a variety of purposes including out of compassion (the widow’s son), to make theological points (healing actions are acceptable on the Sabbath – Matt 12:9-13), to give His disciples courage (raising of Lazarus), to give glory to God (blind man – John 9:3) and to return people to community (woman with hemorrhage – Matt 9:20-22; the leper – Luke 5:12-15). Responds with and without petition – The majority of the healings recorded in the Gospels are for those who petition the Lord in faith (e.g. the Centurion, Jairus, etc.). Jesus also acts freely to heal people who do not ask for healing (e.g. the diseased man at Pool of Bethzatha, Demoniacs of Gerasene, the Widow of Nain). Provides healing today through the Sacraments – Jesus continues to work to heal Man by forgiving sin through the Sacrament of Reconciliation (CCC 1422-1498) and to heal all illnesses through the Sacrament of the Anointing of the Sick (CCC 1499-1532).